Dr. Keith Mercer is a Research Associate at the Gorsebrook Research Institute, Saint Mary's University. Dr. Mercer received his PhD from Dalhousie University in 2008, and has published numerous articles on Canadian maritime history with a focus on press gangs and resistance to impressment. You can read several of these articles in full at his official website KeithMercer.com. I showed Dr. Mercer seven primary source images depicting press gangs at work, and asked him to choose one that best captured the nature of press gangs in the eighteenth century. These are all terrific images. What's so exciting about studying press gangs these days is the quality and quantity of the scholarship -- in Britain, North America, and the wider Atlantic World. It's a welcome change from when I picked up the topic in grad school 15 years ago. For my part I've focused on the Canadian colonies, particularly civil-naval relations in the naval ports of St. John's, Halifax, and Quebec City. No one had really studied that topic before. There exists folklore and popular memory about press gangs, but that's about it. My answer thus stems from the Canadian context. 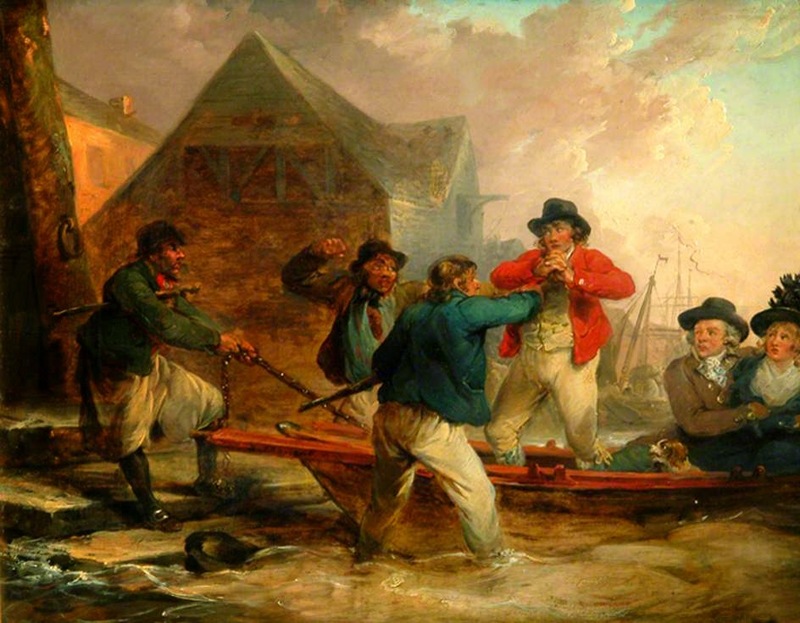 Like Marcus Rediker, I choose the Morland painting from 1790, which I've always called "Jack in the Bilboes." 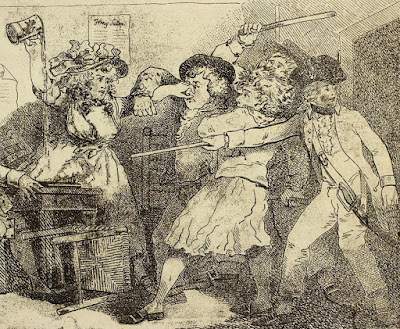 Interestingly, as in Denver Brunsman's answer about the Falklands crisis in 1770, this depiction of a press gang may have resulted from another large-scale, peacetime mobilization of the Royal Navy in 1790 stemming from the British-Spanish territorial dispute over Nootka Sound (off British Columbia, Canada). Britain's rapid mobilization of its powerful navy was a major deterrent for Spain and likely prevented war. It included significant impressment, including "presses from all protections." Even the North American squadron based at Halifax used impressment to get in fighting shape. But the colonial government resisted, especially pressing on shore. This image is the only one showing impressment at sea, albeit in a boat coming ashore. For me this speaks to a common misconception about impressment. In the vast majority of cases, certainly away from the major British port towns and the government-operated Impress Service, impressment occurred on the water rather than on land. This included boats coming ashore, merchantmen stopped on the high seas and along the coast, and particularly naval guard boats and cutters boarding incoming vessels in harbours. In other words, the traditional caricature of the press gang accosting civilians on the street or barging into taverns was both a relatively rare occurrence and something of an anachronism, especially in the Canadian and colonial American contexts. Impressment on shore was just too dangerous, for those doing the pressing. It often led to violence, political disputes, and negative publicity. Press gangs were relegated to the water, where they were far more productive anyway. Unless sailors jumped ship, which was very dangerous at sea, they were not getting away. Keep an eye out for Dr. Mercer's upcoming book North Atlantic Press Gangs: A Social History of the British Navy in Canada, 1675-1815. For more information about his work, to read his blog, and more, visit KeithMercer.com.